تصویربرداری اولتراسوند درون رگی یا IVUS روشیبا حداقلتهاجماستکهدر آن با تصویربرداری ازمقطعرگ،اطلاعاتدقیقی از درون آن بدست می­آید. 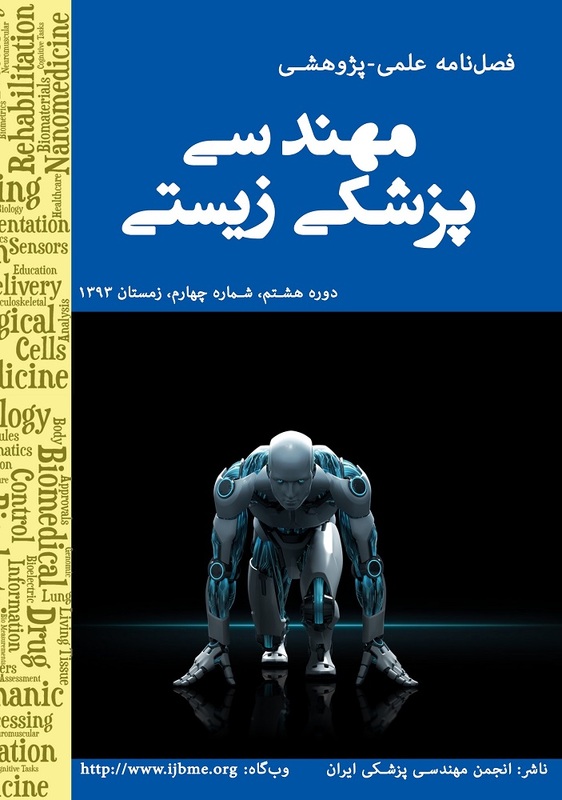 پردازش‌هاییکهرویاینتصاویریاسیگنال­هایخامآن‌هاانجاممی‌پذیرد،می‌تواند اطلاعاتوسیعی در اختیار متخصصانوپزشکانقرار داده و برایتشخیصدقیق و اتخاذ شیوه­ی مناسب درمان کمککند. تفکیک مرزهای بافت موجود در عروق خونی به عنوان اولین گام در این زمینه، یکی­از چالش‌های تحقیقات امروزی است.در این مقاله، روشی جدید برای استخراج مرز بافت ادونتیشیا در تصاویر اولتراسوند داخل رگی پیشنهاد شده است که براساس تکنیک کمینه/بیشینه و مؤلفه‌های هم­بند عمل می‌کند. بدین منظور، ابتدا با تکنیک کمینه/بیشینه بهبود یافته مرز اولیه استخراج شد. سپس، با به کارگیری مؤلفه‌های هم­بند در مرزهای اولیه، مرز نهایی با دقت بالا حاصل شد. برای ارزیابی عملکرد این روش، روی مجموعه­ای از دادگان واقعی آزمایش شد. از معیار مشابهت اندیس جاکارد و فاصله هاسدورف که نشان دهنده‌ی میزان هم­پوشانی ناحیه­ی بخش شده به وسیله روش پیشنهادی و تشخیص پزشک است بهره گرفته شد. نتایج به دست آمده نشان داد که روش پیشنهادی با معیار میانگین اندیس جاکارد 95% و میانگین فاصله هاسدورف 45/0 میلی­متری، مرزهای دقیق­تری برای بافت ادونتیشیا نسبت به روش‌های موجود بدست می­آورد. IVUS imaging is a minimally invasive blood vessel cross-sectional imaging procedure in which accurate data is obtained from what is in there. Processing on these images or raw signals can provide wide range information for experts and practitioners, and can help them in making an accurate diagnosis and appropriate treatment. Extraction of tissue boundaries in the blood vessels is one of the challenging parts as a first step in this direction. In this paper a new method was proposed based on the minimax technique and connected components for extracting Adventitia tissue boundary in intravascular ultrasound images. For this purpose, initial boundary will be extracted using improved minimax technique. Then final boundary is extracted with high precision using connected components. The method was tested on a set of real data with regard to the Hausdorff distance and Jaccard index to evaluate its performance. Mean of Hausdorff distance and mean of Jaccard index were obtained 95% and 0.45 millimeter, consequently. These results show that the proposed method in this paper can extract Adventitia tissue boundaries more accurately than existing methods with regard to the distance Hausdorff distance and Jaccard index. E. G. Mendizabal-Ruiz, M. Rivera, I. A. Kakadiaris, "Segmentation of the luminal border in intravascular ultrasound B-mode images using a probabilistic approach" Medical Image Analysis 17 (6), 649–70, 2013. A. Katouzian, E. Angelini, S. Carlier, J. Suri, N. Navab, A. Laine, “A State of The Art Review on Segmentation Algorithms in Intravascular Ultrasound (IVUS) Images” IEEE Transactions on Information Technology in Biomedicine 16 (5), 823-834, 2012. A. Taki, Z. Najafi, A. Roodaki, S. K. Setarehdan, R. A. Zoroofi, A. Konig, N. Navab, “Automatic segmentation of calcified plaques and vessel borders in IVUS images” Int J CARS 3, 347–354, 2008. M. Jourdain, J. Meunier, J. Séqueira, G. Cloutier, J. C. Tardif, “Intravascular Ultrasound Image Segmentation: A Helical Active Contour Method” 2nd international conference on Image Processing Theory Tools and Applications, 92–97, 2010. Q. Zhang; W. Wang; J. Ma; J. Qian; J. Ge, “Contour Extraction from IVUS Images Based on GVF Snakes and Wavelet Transform” IEEE/ICME International Conference on Complex Medical Engineering, 536–541, 2007. M. Yoshizawa, A. Tanaka, O. Saijo, T. Iwamoto, T. Yambe, S. Nitta, “An adaptive fuzzy segmentation of intravascular ultrasound images” IEEE International Symposium in Biomedical Imaging: Nano to Macro 1311-1314, 2004. J. A. Noble, D. Boukerroui, “Ultrasound image segmentation: a survey” IEEE Transactions on Medical Imaging, 25 (8), 987-1010, 2006. P. Constantinides, “Plaque fissures in human coronary thrombosis” Journal of Atherosclerosis Research, 6 (1), 1-17, 1966. D. Selvathi, N. Emimal, “Statistical modeling for the characterization of atheromatous plaque in Intravascular Ultrasound images” International Conference on Devices, Circuits and Systems (ICDCS), 320–324, 2012. R. D Downe, A. Wahle, T. Kovarnik, H. Skalicka, “Segmentation of intravascular ultrasound images using graph search and a novel cost function” Proceedings of 2nd MICCAI, pp. 71-79, 2008. D. Gil, A. Hernández, O. Rodriguez, J. Mauri, P. Radeva, “Statistical strategy for anisotropic adventitia modelling in IVUS” IEEE Transactions on Medical Imaging 25 (6), 768-778, 2006. K. Li, X. Wu, D. Z. Chen, M. Sonka, “Optimal surface segmentation in volumetric images-a graph-theoretic approach” IEEE Transactions on Pattern Analysis and Machine Intelligence 28 (1), 119-134, 2006. P. Siogkas, A. Sakellarios, T. P. Exarchos, L. Athanasiou, E. Karvounis, K. Stefanou, O. Parodi, “Multiscale-patient-specific artery and atherogenesis models” IEEE Transactions on Biomedical Engineering 58 (12), 3464-3468, 2011. D. M. Herrington, T. Johnson, P. Santago, W. E. Snyder, “Semi-automated boundary detection for intravascular ultrasound” Proceedings of IEEE in Computers in Cardiology 103-106, 1992. I. Tokimitsu, H. Kato, H. Wachi, S. Tajima, “Elastin synthesis is inhibited by angiotensin II but not by platelet-derived growth factor in arterial smooth muscle cells” Biochimica et Biophysica Acta (BBA)-Protein Structure and Molecular Enzymology 1207 (1), 68-73, 1994. B. N. Saha, N. Ray, “Image thresholding by variational minimax optimization” Pattern Recognition 42 (5), 843–856, 2009. A. Kermani, A. Ayatollahi, A. Mirzaei, M. Barekatain, “Medical ultrasound image segmentation by modified local histogram range image method” Journal of Biomedical Science and Engineering 3 (11), 1078–1084, 2010. S. Balocco, C. Gatta, F. Ciompi, A. Wahle, P. Radeva, S. Carlier, G. Unal et al. "Standardized evaluation methodology and reference database for evaluating IVUS image segmentation" Computerized Medical Imaging and Graphics 38 (2), 70-90, 2014. P. Jaccard, “Etude comparative de la distribution florale dans une portion des Alpes et du Jura” Impr Corbaz 1901. M. H. R. Cardinal, G. Soulez, J. C. Tardif, J. Meunier, G. Cloutier, “Fast-marching segmentation of three-dimensional intravascular ultrasound images: a pre-and post-intervention study” Medical physics 37 (7), 3633-3647, 2010. G. Unal, S. Bucher, S. Carlier, G. Slabaugh, T. Fang, K. Tanaka, “Shape-driven segmentation of the arterial wall in intravascular ultrasound images” IEEE Transactions on Information Technology in Biomedicine 12 (3), 335-347, 2008. R. Downe, A. Wahle, T. Kovarnik, H. Skalicka, J. Lopez, J. Horak, M. Sonka, “Segmentation of intravascular ultrasound images using graph search and a novel cost function” In Proceedings of 2nd MICCAI Workshop on Computer Vision for Intravascular and Intracardiac Imaging 71-79, 2008. C. V. Bourantas, F. G. Kalatzis, M. I. Papafaklis, D. I. Fotiadis, A. C. Tweddel, I. C. Kourtis, L. K. Michalis, “ANGIOCARE: An automated system for fast three‐dimensional coronary reconstruction by integrating angiographic and intracoronary ultrasound data” Catheterization and Cardiovascular Interventions 72 (2), 166-175, 2008.